• The Wrong Way: head and shoulders way out in front of hips and knees, resulting in a loss of that normal curve in the spine, which takes all the stress and puts it right on the spine, making injury much more likely. 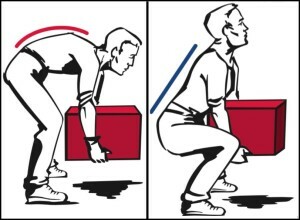 • The Right Way: you can see from this picture that the head, shoulders and knees are staying stacked on top of each other before the lift occurs. This allows the spine to stay in a more natural position for the lift, which will reduce the risk of injury to the spine. 2. 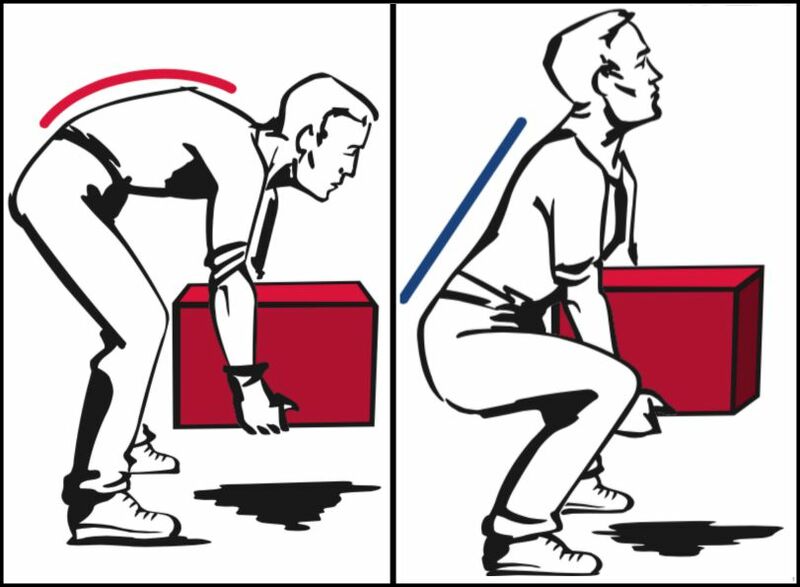 Try to keep the load you are lifting close the body. Lets look at one of my favorite diagrams (thanks to the Gonzaga University web site for use of the visual, www.gonzaga.edu) that shows why this is important to keep the back safe. • This diagram demonstrates the forces exerted on our spine under various positions. Here I would like to highlight the difference between the second and third figures from the left. Merely holding a 20 pound object 20 inches compared to 10 inches away from the body, results in an increased 90 pounds of pressure on the spine. So remember to keep that load as close as possible next time you pick something up to move it! 3. Lift with the legs and keep the tummy tight. Sounds easy right? And it should be; however, for someone with knee pain or weak legs this task is not easy at all! Most of my patients have trouble demonstrating good form with a squat because of weak or tight legs and hips, and this makes lifting with good form difficult. So work on those legs and contact me at The Fit Stop if you have any questions on a safe exercise program for the legs that will help you to be a better lifter. Also, when thinking about keeping the tummy tight, think “bellybutton to spine”, which tightens the corset muscle of your trunk. This will also provide protection for the back. 4. 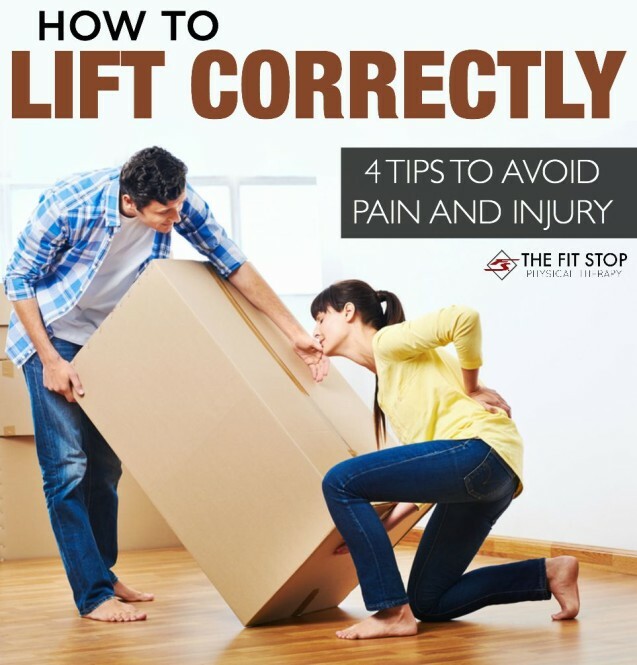 Lift slowly and in control while trying to avoid twisting movements when lifting heavy objects. One of the worst things you can do to your pack is twist with a heavy load. This really stresses the joints in your back and puts them at increased risk for injury and pain. Instead of rotating your spine try pivoting your legs to keep the load in as neutral a position as possible. And there you have it! Four great tips to help you avoid injury the next time you’ve got some lifting to do! Incorporate these tips when you lift, and you will be much more likely to finish without a serious set back. As always, call me or stop by anytime if you have any questions. 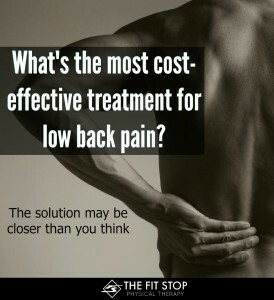 Looking for more great posts to help your back pain?